Hotels, planes, and other public travel spaces can be a breeding ground for germs that cause cold, flu, or other infections. Luckily, there are small things that can make a big difference in preventing illness—our Chief Medical Officer, Dr. William Siegart, shares his favorite tips, tricks, and hacks for staying healthy during the busy holiday travel season. Stay Active: When traveling, it can be easy to forget all of your home habits in the hustle and bustle of holiday plans and hectic schedules. However, it’s important to keep exercise as a part of your routine as it will boost your energy and fight off jetlag. If flying, make sure to stand up and walk up and down the aisles every so often, and instead sitting at your gate while you wait to board, walk laps around your section at the airport. You can also walk to your gate as opposed to taking a shuttle. If driving, make sure to take regular breaks and get out of the car every few hours. Get Some Sleep: Prior to your trip, make sure to get a full night of sleep. Being well-rested is always important, but traveling well-rested is especially important to protect your health during busy travel times when you are exposed to more germs from the people around you. Lack of sleep can compromise your immune system and make you a magnet for illnesses. Additionally, it can cause you to be less alert while traveling or driving, leaving more room for error. Choose Healthy Food: While in an airport or on the road, the temptation to grab fast food or a sugary treat for convenience can be hard to resist. Right the urge by planning ahead and packing food that is portable and healthy. Veggies, fruits, protein bars, and nuts are all great on-the-go snacks (and are TSA-approved as well!). Keep Hydrated: When traveling it can be tempting to have a few drinks in-flight; however this will only contribute to exhaustion and dehydration. Skip the sugary drinks and coffee, too. Water is the best option. In fact, experts recommend drinking about eight ounces of water every hour you’re in the air (you may want to spring for that aisle seat after all!). Manage Stress: The holidays can be an extremely stressful time for many. It’s important not to let the stress get to you as it can lead to its own health issues, including headaches, gastrointestinal distress, and chest pain. If crowds bother you, stay away from huge tourist attractions or shopping centers that may be packed due to the season. When booking flights and accommodations, create a schedule that allows plenty of time to get from Point A to Point B. This can help eliminate the stress that comes with rushing from one place to the next. Find a few moments for yourself every day so that you can focus on relaxing, taking deep breaths, and keeping your stress levels under control. Get Vaccinated: If you haven’t already, now is the time to receive the flu vaccine. Influenza can ruin holiday plans and predispose you to more severe medical complications. Influenza is spread by droplets expelled when an infected person coughs or sneezes and the virus comes into contact with another person’s mucus membranes (mouth, nose). You should also check the CDC and State Department websites for their other vaccination recommendations specific to your travel destination. Keep It Clean: Exposure and subsequent infection are amplified in small enclosed spaces such as airplane cabins and hotel rooms. It is also possible to become ill from influenza or other germs by touching a contaminated surface and subsequently touching your face, nose, mouth, or eyes. Wash your hands and use hand sanitizer frequently. Consider wiping down the surfaces in your airplane seat area with an alcohol-based sanitizing wipe. Light switches and remotes in your hotel room are also other commonly contaminated areas that can benefit from a good wipe down. Think Outside the Box: When going through the airport security line or walking through the aisles of an airplane, avoid going barefoot. Avoid any bacteria on the floor by wearing (and disposing of) a cheap pair of socks. Consider bringing your own travel-sized blanket and pillow for the plane and flush non-automatic public toilets with your foot. Also, do not drink from glasses placed in hotels (especially in the bathroom!) unless they are sealed in plastic wrap. 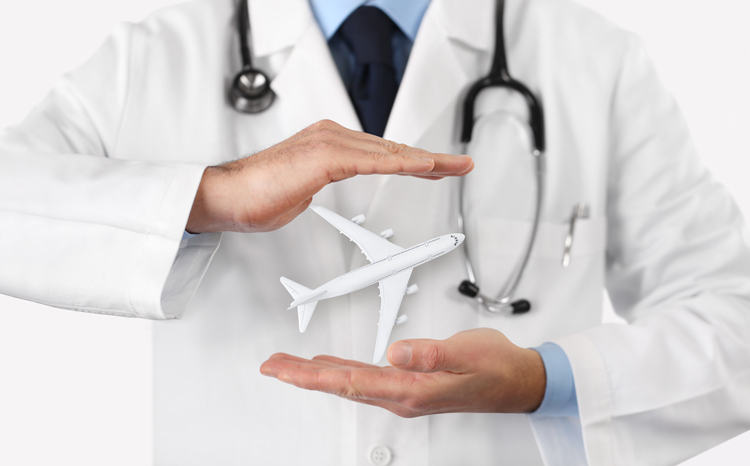 Want to learn more about healthy travel and holistic risk management? Contact us today. Amazing post. Love reading your article I mostly travel and love to read travel tips and tricks.Thanks for the post. Keep sharing.